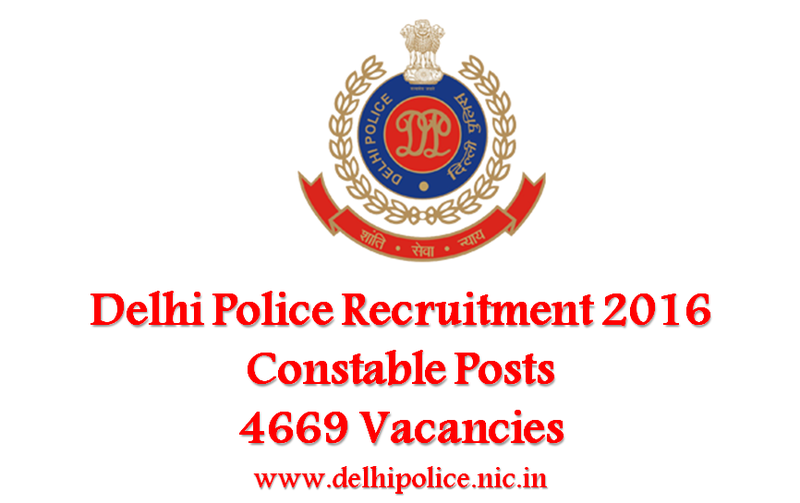 Delhi Police Recruitment 2016 Update: Delhi Police recruitment for 4669 constable posts will begin during September/ October. This will be a great opportunity for all the candidates who have an educational qualification of 10+2 pass and want to pursue a career in police and paramilitary force. Delhi Police has finally got the nod for beginning the recruitment process for 4669 constable posts (3611 male constable; 1058 female constable). The Union Home Minister has approved the proposal and the recruitment process will begin during September/ October. This is going to be the largest recruitment process after Commonwealth Games 2010. Delhi police is also planning to implement certain unique methods in the recruitment process to make the selection process more transparent and ethical. The recruitment process will be conducted by Staff Selection Commission (SSC). Candidates will be selected on the basis of their performance in the Physical Endurance, Measurement Test and Written Test. Physical efficiency test will be held across the nation in all the States and UTs, thus encouraging all-India recruitment. Online written tests will be conducted by SSC. Out of the total number of vacancies, 33% will be reserved for women. No interview will be conducted for those who clear the physical, written and medical examinations. As per the last update released in this regard, candidates with an educational qualification of Senior Secondary (10+2) can apply for the posts. The minimum age for this purpose is 18 years with the maximum being 21 years whereas the minimum height required is 170 cms and the chest is 81 to 85 cms. This massive All-India recruitment drive is ought to counter the manpower shortage in Delhi Police. The existing strength of Delhi police is 78000 i.e. one constable for 238 people. Delhi Police offers a number of opportunities to the youths of the country to get into the police force. The organisation generally recruits for Constables, Sub Inspectors, Head Constable (Ministerial), Assistant Sub Inspector (Stenographer) and Assistant Commissioner of Police. There are written examinations for these posts followed by physical test. It is directly controlled by the Ministry of Home Affairs though it works to control the law and order situation of the Delhi Region. Hence, the force is unique in its administrative control which gives it more prestige and power compared to other police jobs. Delhi police is also one of the most culturally diverse forces in the country. Opportunities are plenty in Delhi Police as well as promotional avenues because of huge vacancy in the upper rung of the force. How to get job in Delhi Police?